Here are the most sought after Parts for Roll Shutters, if you don't see your part listed please send an email with part info, as we may have it in stock but not have it listed on the site yet. 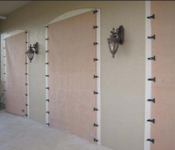 45 Degree End Caps for Roll Shutters, LARGE LEG, sold by the pair Left and Right, 5 Colors and 6 Sizes Available. Aluminum Cap with Round Pivot, choose 60mm or 70mm, for Octagonal Roll Shutter Tubes. Brass Wood Bushing Anchors, Slotted, 1/4-20 Inner Thread, Wood Anchor Bushing is 3/4" Long by 1/2" Diameter, choose Quantity. Octagonal Tube, 58MM, Aluminum, for Roll Shutter Motors and or Reel Tubes. Hex. BERTHA Reel Sleeve, Aluminum, for Roll Shutter Slats and Motors, 3.154 Diameter, Please call for pricing and ordering. Reel Tube 60mm, Aluminum mill finish, Round 2.365 ID, Choose desired length. Reel Tube 70MM, Aluminum, For Roll Shutter Motors and Slats, Choose Regular thickness .168 or Heavy Duty .215 sizes, 3" round Outside with Octagonal Hex inside. 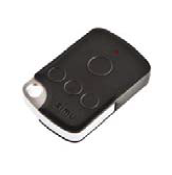 SIMU External Hz Receiver for Roll Shutters, Micro Motor 120V AC, for SIMU models only. SOMFY Universal External Hz Receiver RTS for Roll Shutters, 120V AC, turn any Standard Motor into a Remote Motor. 45 Degree End Cap, Small Leg, available in 5 Colors, and 7 sizes to choose from. Sold by the Pair Left and Right. Hz TRANSMITTER Wall Switch, 5 Channel Recessed Designer style, choose White or Ivory. 20A. 90 Degree End Caps for Roll Shutter Hoods, sold by the pair Left and Right, SMALL LEG ONLY, Mill Finish Silver Only, 3 Sizes. Adjustable Articulated Cap for Roll Shutters, quadruple swivel on center. 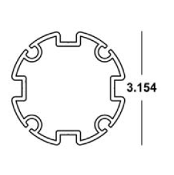 Stainless Steel Center Bearing, 1 5/8" Outer diameter, 5/8" Center Hole, total width 3/4". 94MM Round Drive Adaptor for Type 8 Tubular Roll Shutter Motors. Aluminum. GROUP RELAY SWITCH, select style, used to control 2 Motors or 3 Motors on 1 Master Switch. Handheld Emitters for Roll Shutters, Hz motor control, 3 Styles to Choose, 1, 5, or 15 Channel. 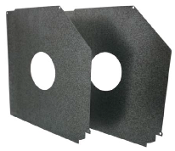 SAFETY PLATES for Roll Shutter Hoods. Sold by the pair Left and Right, 5 sizes to choose from, Aluminum Mill Finish Silver Only. SIMU Motor Adaptor Kit, Crown & Drive, for Type 6, 70mm Octagonal Set, Aluminum Drive Wheel. MOTOR ADAPTOR Kit for Type 5 Roll Shutter Motors, includes Crown and Drive, choose 60MM or 70MM, Aluminum Drive Wheel. Motor Operator Brackets for Type 5 SIMU Roll Shutter Tubular Motors, choose 80MM Square, 100MM Square, or DMI Override T5 and T6. Override Motor Eye and Shaft for both Type 8 and Type 9 Tubular Roll Shutter Motors. PADDLE SWITCHES for roll shutters, Single Pole, Maintained or Momentary Style. 15A. 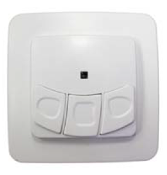 Designer PADDLE SWITCHES by SOMFY. 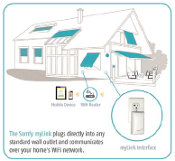 Somfy Mylink Home Automation System. Turn your Smartphone or Tablet into a Remote Control, use for any motorized Shutter or Blinds. Program up to 16 Channels. 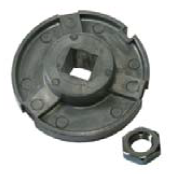 Spring Support Plate, 100mm x 100mm, with retainer screw and nut, includes mounting screws. Twenty Channel Wireless Receiver for Roll Shutters, Hz Radio Control. Makes a Standard motor a Remote motor. SIMU Motor Operator Bracket for Type 6, choose Standard or for Override Motors, 100mm x 100mm. Tubular Motor Brackets, for type 8 Roll Shutter Motors. T8 Mounting Bracket Angle, 2 piece set includes Bolts, nuts, and Washers. 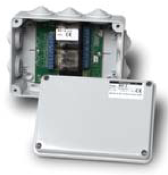 Wall Mount Emitter for Roll Shutters, choose 1 Channel or 2 Channel model. 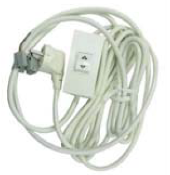 Wall Mounted Emitter. SPECIAL ORDER ITEM, 3 week wait. Aluminum Gear Insert, choose 60mm or 70mm, for Roll Shutter Tubes or Reels. 13mm Square insert hole (9/16"). Ball Bearing End Cap Idler, choose 60mm or 70mm, made of Hard Plastic, for Roll Shutters, 42mm Ball Bearing sold seperately. DOOYA Tubular Motor, Type 5 Standard DM45S or With Override DM45M. 50Nm, 13RPM, 120V, 60Hz, 235W, 2.2A, 130 - 210 lbs. Double Adjustable Cap, Choose 60mm or 70mm, for connecting Roll Shutter Reels. End Retention Screws for 55mm Slat Lock Guide, HV Hi Velocity, Coated Stainless Steel, 10 x 2 1/2" Phillips Head, choose Total Pieces desired. Awning Handle Crank and Hook, Manual Hand Crank, 5 Feet Long, Shipped Assembled, Plastic Coated Metal, Hard Plastic handles. Both Handles Spin,.. Replacement Bell for Roll Shutter Crank Handles, includes the Spring Pin for easy repair of your broken crank handle. Nickel Plated. Bottom Slat Weather Seal for Roll Shutters, Black Rubber Bulb Gasket Seal, Fits 40mm, 55mm, 58mm, and 60mm Slats. Choose Length. Conical Stop for Roll Shutters, or Hole Plug, 4 Colors to Choose from, includes Bolt. White, Ivory, Beige, or Bronze. 1 9/16" Long, 3/4"OD - 1"OD. End Retention Slat Lock Glide 55mm, Black Plastic, includes Top and Bottom. End Retention Slat Lock Glides are inserted into the ends of the Roll Shutter slats to keep them from sliding. 40mm Entry Guide for Roll Shutter Doors, White Nylon, Left and Right side are molded together and count as 1 piece, simply cut apart. 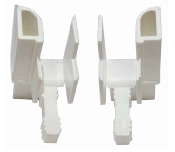 Entry Guide for Roll Shutter Doors, Replacement Parts, Track Door Guide, White, fits 55mm & 60mm. Hz Transmitter Remote for Roll Shutter, 1 or 5 Channel, Radio Controlled Systems, White only, Handheld Remote Style with Wall Clip Holder. 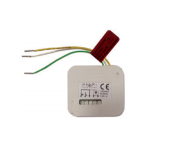 120V Test Switch for Roll Shutter Installations, a must have for Professionals, also compatible for most all other Electrical type Installations. Intermediate Bracket Support for Roll Shutter motors or gears, for continuous units. Gear Plate Bracket for the SIMU 1424 Gear, 100MM Square (4 inches). Screws, Gear, and Connector not included. Made of Hardened Steel. 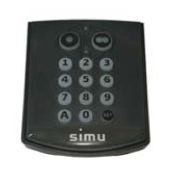 SIMU Idler Cap, 60mm or 70mm, both sizes will fit with the SIMU Spring Support Plate. SIMU Roll Shutter Motor Type 8 Standard with Overide, Tubular, 200Nm, 94MM Diameter, 10 RPM, 120V. Crowns, Drives, and Brackets sold separately. 40MM Slat Hanger for Roll Shutters, Replacement Straps, choose from 4 pieces to 24. All Aluminum. Slat Hanger for 55MM, 58MM, and 60MM Roll Shutters. Tube Straps. 7 1/2" x 3/4" strap length, 4" x 1 1/8" clip length. Choose from 4 straps to 24. Slat Lock Glide 40MM, 2 piece Left and Right Set, Hard Black Nylon, for Roll Shutters. Made by BERTHA®. 40mm Slat Lock Glide is 1 7/8" Top Length,..
Slat Lock Glide 58MM for Roll Shutters, Black Nylon. They are 2 5/8" Long by 1/2" Wide ends, holes are spaced 1 5/8" on center. Universal Gear Plate, 100mm x 100mm, choose With or Without Center Pin, includes mounting screws. 42MM Ball Bearing with Stainless Steel Bushings, for Roll Shutters. 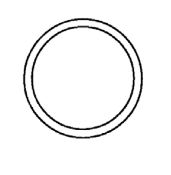 Measures 1 5/8" in Diameter, the center hole is 1/2" diameter, and it's 3/8" wide. Bullet for Universal Pivot, Roll Shutter Crank Handle Bullet for Bell. Mates with bell for a removeable crank handle. Includes the screw. Hood Rollers for Roll Shutters, 40 x 95 x 30 MM, starting at $10.99 for 2 Hood Rollers, choose up to 10 with shipping discount.